In 2017, workers and residents of Colombia’s principal Pacific port of Buenaventura launched a three-week civic strike that forced the Colombian government to negotiate solutions to the city’s social and human rights crisis. This historic moment and action highlights the many challenges to economic and social justice that remain in Colombia, a country with among the highest poverty and inequality rates in Latin America. While the Colombian government signed peace agreements in the autumn of 2017, violence connected to large landowners and corporate economic interests remain active throughout the country, and privatization, land grabs and massive dislocation of the rural population continue to be commonplace. 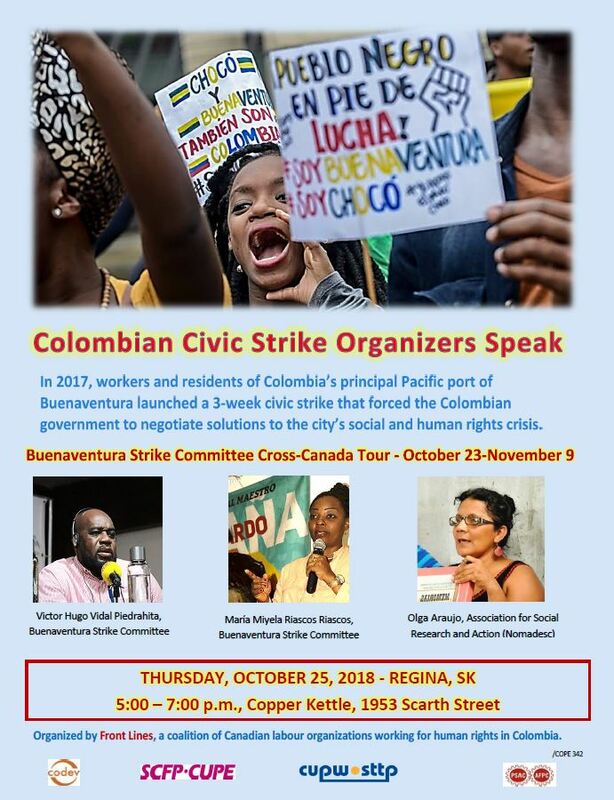 Take the opportunity to meet the Buenaventura, Colombian Strike Committee, in a reception hosted by the CUPE Saskatchewan Global Justice Committee. When: Thursday, October 25, 2018, from 5:00 – 7:00 p.m. The event is free of charge. Appetizers provided. All CUPE members and other unions welcome! CUPE, through its global justice initiatives, continues its solidarity with Colombian workers and Indigenous and Afro-Colombian communities in our mutual fight to stop the privatization of public services and to support that country’s fragile peace process. Click here to view and print the October 25, 2018 event poster.